A mesothelioma diagnosis is rare but it happens to about 3000 Americans every year. There is a good chance that symptoms such as a persistent cough, shortness of breath, fever, sweating, and fatigue, difficulty in swallowing and chest pain could just be the flu or a cold. But if these symptoms do not go away it is important to consider a mesothelioma diagnosis, especially if you think you may have been exposed to asbestos at any point in your life. Mesothelioma is a lethal cancer caused by breathing in asbestos dust. One of the most tragic aspects of mesothelioma is that it is dormant for years – even decades. You don’t know you have it when it is in its earliest most treatable stage. When symptoms emerge it means the train has left the station – and sadly, it’s an express train. Once it presents itself in the form of symptoms, mesothelioma can move quickly. Treatment can help prolong life. But to get treatment, a firm mesothelioma diagnosis is needed. Because of the catastrophic nature of this illness, you may even want to get a second opinion. A mesothelioma diagnosis begins with a thorough physical exam and medical history by your primary care doctor. During this exam it is important to discuss your symptoms, medical history and work history including any past exposure to asbestos. With basic diagnostic tools such as a stethoscope, your doctor will check for fluid around the lungs, heart or abdomen – areas where mesothelioma may develop. Even if your doctor detects a fluid build-up in one of these areas – a sign that mesothelioma may be present – you likely will not receive an official mesothelioma diagnosis. You will be referred to an oncologist and/or other specialists for detailed imaging tests. What specialists you see next for your mesothelioma diagnosis will depend on what hospitals your primary care physician is affiliated with and what cancer centers are in your area. A thoracic surgeon: a doctor who treats diseases of the lungs and chest with surgery. A surgical oncologist: a doctor who treats cancer with surgery. 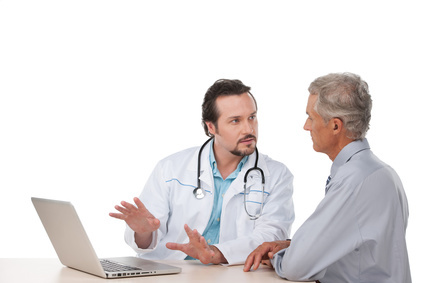 A medical oncologist: a doctor who treats cancer with medicines such as chemotherapy. A pulmonologist: a doctor who specializes in medical treatment of diseases of the lungs. Chest x-ray This is the first imaging test for a mesothelioma diagnosis. If the x-ray reveals changes in the lungs or the lung membranes or fluid between the lungs and the chest wall, mesothelioma may be present. CT scan Short for computed tomography, a CT scan relies on a rotating camera to take multiple x-ray images from different angles. The images are digitally combined to provide a more precise tool for mesothelioma diagnosis. A CT scan can also detect whether mesothelioma has spread to other organs. This helps determine whether surgery is a possible treatment. Echocardiogram This test uses sound waves to check for mesothelioma in the lining of the heart. The technician moves the instrument around the part of the chest where the heart is located to pick up sound waves that indicate the presence of fluid. PET scan Positron emission tomography, Pet scan for short, relies on the injection of a mix of low level radioactive fluid with sugar to help determine a mesothelioma diagnosis. Because cancer cells grow so rapidly, they like sugar to fuel their growth. The radioactive component of the injected mixture highlights where in the body the sugar is being quickly absorbed. These are usually cancerous areas. A PET scan also can help confirm a thickening in the lining of the lungs or heart. MRI Magnetic resonance imaging, called MRI for short, delivers images of highly active areas inside the body using magnets and radio waves. An abnormally high level of activity usually means there is a growing tumor. MRI scans also help show the exact location and extent of a tumor because of the highly detailed images they provide. This can help with a mesothelioma diagnosis. A mesothelioma diagnosis often is confirmed by going into the body to remove a tiny sample of fluid or tissue. This tissue sample is sent for analysis to a pathology lab. The tissue samples are examined under a microscope to see whether they contain mesothelioma cells. Endoscopic biopsies These biopsies are the most widely used tool for a mesothelioma diagnosis. A long thin tube with a light and a lens or video camera is used to look inside the body and remove tissue from suspected mesothelioma areas. Thoracoscopy is done inside the chest. It can also take samples from nearby lymph nodes to check whether the cancer has spread. Laparoscopy is the biopsy procedure that looks inside the abdomen for any possible tumors in that area. Open surgical biopsy If a mesothelioma diagnosis is still uncertain, this more invasive type of biopsy may be used. It involves the removal of a larger section of tissue that can be analyzed. If a mesothelioma diagnosis is confirmed, the next step is to consider treatment options with an oncologist. You should also meet with the financial advisor on the oncology team for help with your medical insurance and financial assistance options. Consider also meeting with an attorney who specializes in asbestos litigation to find out whether you may have a case for an asbestos lawsuit – this could help postpone medical bills pending a settlement, help pay for all needed treatment not covered by insurance, and help insure your family’s financial security in the years ahead.